Chrystal Osborne, recipient of the Ted Bauer Leadership Award, with (from left) Professor George Gamble, Bauer College Dean Arthur Warga, and Associate Dean Bob Casey. A few of the brightest lights from UH C. T. Bauer College of Business – including students, faculty and staff – were honored recently at the 7th Annual Student Leadership Awards Luncheon. Reading excerpts from some of the nomination forms submitted, presenters at the Hilton Hotel made note of top students such as the two recipients of the Ted Bauer Leadership Award, Chrystal Osborne, president of the National Association of Black Accountants, and Mario Cantu, president of the American Marketing Association. 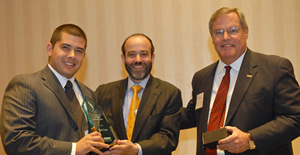 Bauer College Dean Arthur Warga, center, and Associate Dean Bob Casey present Mario Cantu, left, with the Ted Bauer Leadership Award. Osborne was part of the NABA team which earned a first place in a national case study competition that had never before been won by a public university. Cantu was noted for his contributions at Presidents’ Council meetings and for exhibiting a passion for education that benefits his peers in numerous ways. Associate Dean of External Relations Bob Casey noted that the award is typically presented to just one student, but this year, two outstanding students were honored because of the strength of their achievements. Beta Alpha Psi, Collegiate Entrepreneurs’ Association, MISSO, Delta Sigma Pi, Hispanic Business Student Association, American Marketing Association and MANet each won awards for student organizations. Among the other recipients: Dr. Michael Newman, director of Accounting programs and visiting assistant professor, for Student Organization Advisor of the Year; Ron Lazer, assistant professor of Accounting, for Faculty Member of the Year; and Frank Kelley, assistant dean of undergraduate business programs, Outstanding Staff Member.The Student Leadership Awards Luncheon is coordinated by the Rockwell Career Center.